The Goat Village: Take me away! Have you ever longed to escape to a place that would take you far far away from the madding crowd? the hustle and bustle of your city life?? Then, The Goat Village in Tehri, Uttarakhand ought to be on your travel bucket list! The Nag Tibba Trek is today one of the most popular treks in the Garhwal region of the Himalayas and is fast catching on as the ideal weekend trek from Delhi due to the fact that it is only 57 kms from Mussorie and also, of course, for the thrill of scaling the highest peak of the Lesser Himalayas. Believed to be the seat of Nag Devta or the Hindu Snake God, the Serpent’s Peak or Nag Tibba as it is called, is home to a shrine to the god who lends this Himalayan peak its name. With one of the nearby villages as a base, the scenic trek through the Himalayan forest to this temple can be done in a day or two, depending on the route one takes. & Half way up this trek from the village of Pantwari is The Goat Village. Of the many initiatives by The Green People to revive abandoned villages in Uttarakhand and encourage reverse migration of farmers, The Goat Village is one. 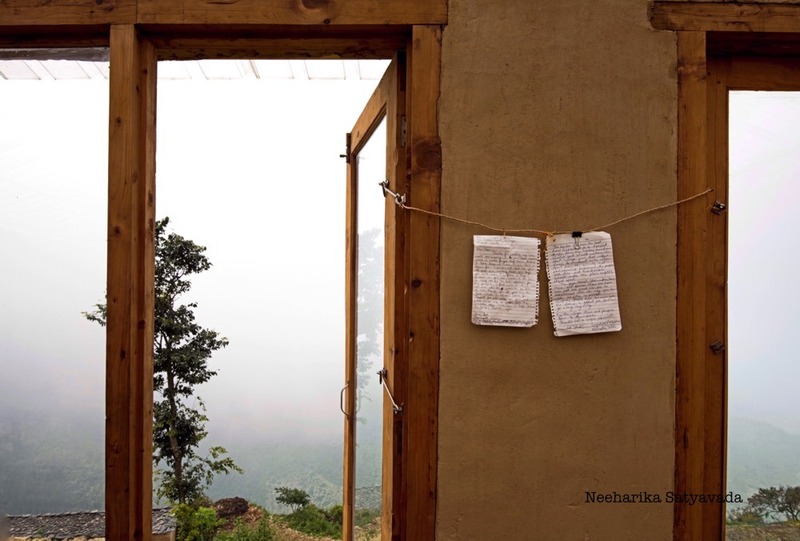 A farm retreat of traditionally curated Garhwal homes built only from wood, mud and slate that chips and falls off the mountains. So, here is this little village of wooden cottages nestled in the Himalayas, where to touch the clouds all you have to do is extend your hand and where there is no electricity or Wi-Fi that you end up doing anything but checking your phone every few minutes for updates! This is where I was invited to recently to experience this ‘Happier Himalayan Village’ first hand and I came away from probably one of the most wonderful trips I have taken in a while. So much so that, when I sit down to blog about it, I notice a sudden slight tinge of the dreamy in my writing style! Ever dreamt of a log cabin on a far away mountain, while you curled up in your cosy corner reading your favourite fairy tale?? Wood, Stone, some Wild Flowers. & yes, a Window Seat! My camera loves this Polyhouse +Cafeteria! All that wood and glass, with the fog just out of sight and the cold mountain air creeping in. Neither could I stop myself then, from clicking photos every time I was in there nor can I stop myself now, from reminiscing and missing the time spent there. Bread made from Raagi (finger millet – the traditional equivalent of Oats), Tea flavoured with the wild mint that grows on the mountain side..need I say more? With this initiative, The Green People are not just offering an interesting way for travellers to escape the mundane and a chance to experience a Himalayan Village in the most earthy way possible, but are also bringing development to these remote areas in a way that the locals themselves are involved – from getting trained in the hospitality sector before they start work at any of The Goat Village properties in the mid and lower Himalayan region, to farming and goat rearing at the village itself to procuring the farm produce from other locals to be promoted under The Green People’s brand of Organic Himalayan Products, Bakri Chaap. So, if off beat places call to you and you are someone who wants a bit of adventure in your holiday, the trek to Nag Tibba with a stop over at The Goat Village would be just about perfect. Also, the “no electricity” living takes this experience to a whole new level and this little fellow here chomping on the sunlight – to charge – just stole my heart! Getting There: The nearest airport is the Jolly Grant Airport at Dehradun from where Pantwari is a 6 hour drive. From here on, it is a 40 minute drive and a 2 hour trek up the mountain. How I wish I could visit this place some day…sigh! Thank you. 🙂 Was a breathtaking place! !